Karlsruhe was built in 1893 for Baron Karl AF von Swaine and is a large timber single-storey Queen Anne house. The architect and/or builder are not known. Von Swaine was one of the first orchardists in the Lancaster area which was the first irrigation area based on the Goulburn Weir. Born in Dusseldorf in 1870, he was a colourful figure in the district, living in a high style, but seems to have taken little part in public affairs. In 1897 he returned to Europe and married, bringing his wife back to Karlsruhe in 1900. In 1903 they returned finally to Europe leaving the property in the hands of the manager and returning only for visits until 1914 when the property was confiscated under the Enemy Aliens Act and later sold to a P Pullar. 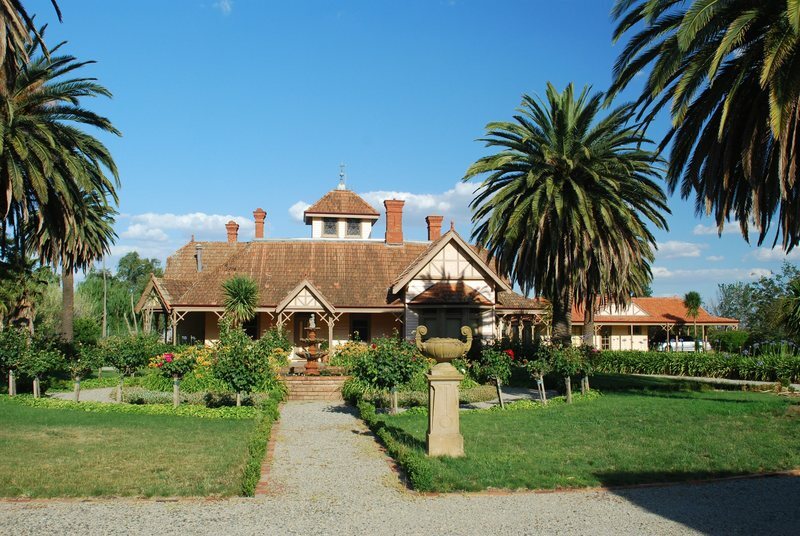 In 1908 the property was described as having 72 acres of trees in the orchard and a private garden of great note, including a hedge of roses a mile long and a cypress hedge across the frontage three-quarters of a mile long. The house is planned with its major rooms leading from a central hall lit clerestory windows in a central tower. The ceiling of this space and the dadoes are lined with alternating dark and light varnished boards. The walls are lined with hessian and paper on laths. Like the typical suburban example of this style, the exterior presents a picturesque array of medieval elements such as the use of full and half-hipped gables and bays and tall corbelled chimneys. Karlsruhe, however, has more of a rural character because of its broad roof expanse and enclosing verandah. The roof is of Marseilles tiles. Also of interest is the packed sawdust insulation to the walls and the underground water tank which incorporates a cellar in its centre. The building is greatly intact although requiring repair. 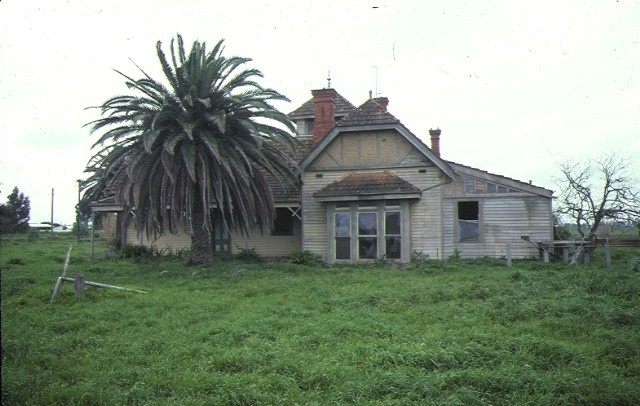 The out-buildings have been removed and only vestiges of the garden remain. 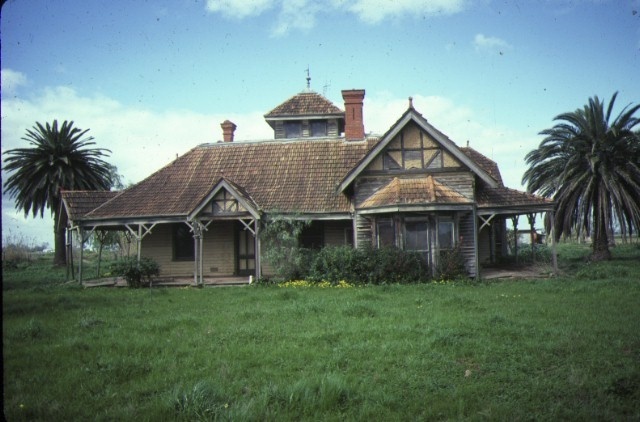 It is of significance as a survivor of one of the first and most colourful participants in the establishment of the stone-fruit industry in the Goulburn Valley and as an elaborate and unusual example of domestic Queen Anne architecture. Historic Building No. 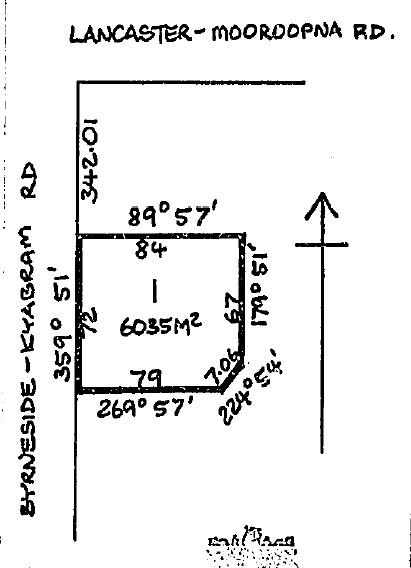 581 Karlsruhe, Byrneside-Kyabram Road, Lancaster (to the extent of the total buildings and land contained within Lot 1, Plan of Subdivision L.P. 145926X, Part Crown Allotment 17, Parish of Mooroopna West).